It was good talking to my family for Mother’s Day. Tomorrow is Mother’s Day here in Nicaraqua, so I think that means I should be able to call again. Right? I liked Somoto a ton, so it was hard to have to leave. I really didn’t want to leave at all. My area is pretty cool though. I’m in the zone called “Las Americas”, on the outskirts of Managua. There are some pretty bad areas though! 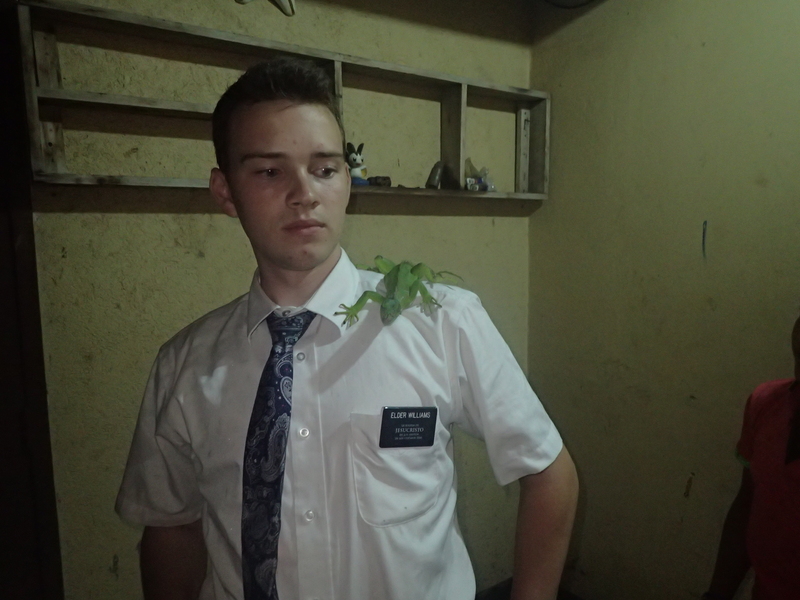 For example, there’s an area called “Tipitapa” where the girls are very flirty with the missionaries. A ton of missionaries have been sent home from that area for having problems with the law of chastity. 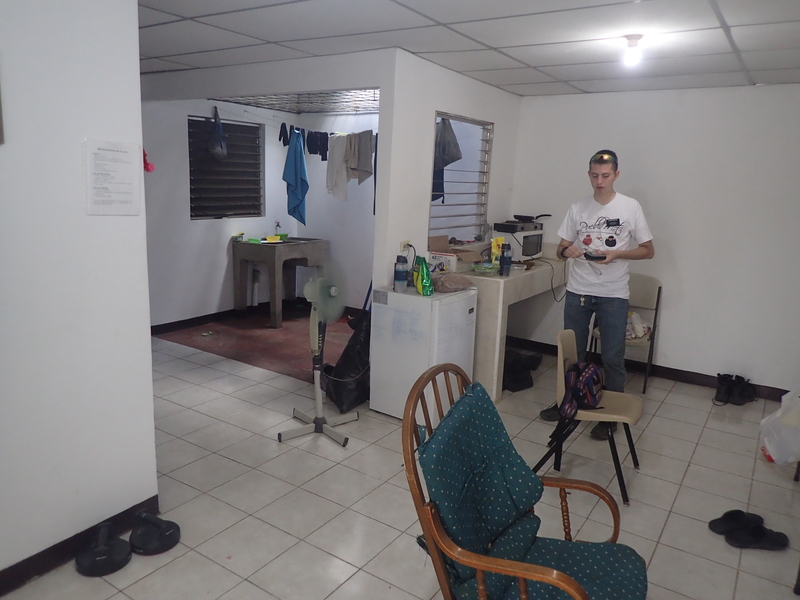 The missionaries made t-shirts that say, “I survived Tipitapa!” We had a zone meeting there today and we played some card and board games, and I won every game. (still his competitive self). I just want you to know I’m not getting rusty, I’ll be ready to play all the board games when I get home. My area has Dr. Prepper! I already bought one of those! It also has a lot of fast food restaurants. There is a mall here, Multi Central, and I think it is a nicer mall than the mall back home, Superstition Springs. It’s crazy! We had to go there to get my card to ride the buses. It’s like an electronically charged card & you pay with your card instead of money to ride the buses. My area is so big, that you have to ride 2-3 buses to get from one side to the other. The church that I go to is the church where the mission office is. Here in Managua it is ridiculously hot! I don’t even know how to explain how hot it is! I know its summer in AZ, but you have air conditioning. You can go swimming. You don’t have the humidity! If I wear my shirt for over an hour it’s “Done”, I won’t be able to wear it until it gets washed. The best part of the day is just sitting in front of the fan. If you are inside of a house without a fan, you just drip sweat! It’s awful! We had an attendance of 81 people in Sacrament meeting which is cool. So, I didn’t have to run sacrament meeting, teach lessons, & lead music, like I did in Somoto. Yesterday, I was kissed by one of my investigators. She’s an investigator we’ve been working with the Senior Missionaries to teach. Here it’s a tradition that when you greet someone who you have a lot of confidence in, or friendship with, you shake their hands or hug them and then kiss them on the cheek. Obviously, as missionaries, we always go for the handshake. But she leaned in & kissed me on the cheek! It was so awkward! It happened right in front of the Senior Missionary, he was just laughing at me! We brought 4 investigators to church yesterday. Apparently, that’s really good for this area. We were supposed to have a baptism this week, but she needed one more attendance and she wasn’t able to come this Sunday. So, we’ve had to postpone it. Last Wed. or Thursday we contacted this family and they were super curious and asking lots of questions. We were there for like 45 min. We checked back in with them a few days later and offered to take them to church. Their 17 year old daughter agreed to come. When we went to get her she was all dressed up in her Sunday best and ready to go. She rode the bus to church with us and attended Young Womens. She says she’s really interested and she’s reading the Book of Mormon. So, that was cool. There’s a huge difference between the people in my last two areas and here. The people here are more educated, have better jobs & they live in families, marriage is less of a rarity here. We taught a lesson with the Senior Missionaries. It was pretty much the worst lesson I’ve ever had. We were teaching the Senior Missionaries banker. I could tell that she was feeling overwhelmed by this long formal meeting. The Senior Missionary who was teaching was a little harsh with her, telling her that all her beliefs were wrong. She started crying & it definitely wasn’t because of the spirit. I guess I’m a pretty empathetic person, because I could feel all of her emotions! I could feel everything she was feeling, & I felt so bad for her! I knew he was being too strong with her, but I didn’t know how to stop him. It’s interesting because for about 20 min., I felt a little bit like Ammon, when he could read the thoughts of the King. It was like I knew her thoughts. It was a really spiritual experience. I knew what she was going to say before she said it. I could tell she was not feeling good. She still has some interest in the church, so hopefully, we can turn things around for her. It’s interesting being DL again and the culture of the zone is totally different! Our house here is pretty nice! It has multiple rooms! It has a rocking chair, a bathroom that’s separate from the rest of the house, and we have real wooden doors, not just curtains! It’s crazy! Hope everything is going great at home. Miss you! See ya!